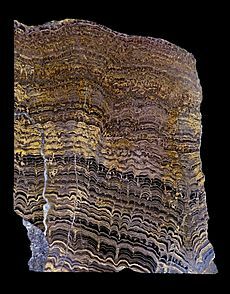 There are some sites where fossils have been found with remarkable details, or in large numbers. Palaeontologists call these sites by the German term Lagerstätten. The La Brea tar pits in Los Angeles is such a place. So are the Solnhofen limestone quarries in Bavaria. 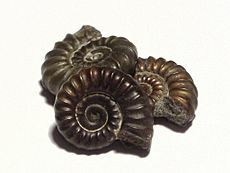 Although most fossils are formed from the hard parts of organisms, there are also indirect signs of prehistoric life. Examples such as a worm's trail or an animal's footprint are quite common. 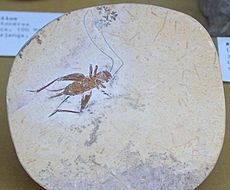 They are known as trace fossils. 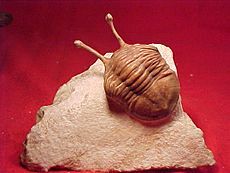 Fossilized excrement, faeces or dung is known as a coprolite. Chemical traces of prehistoric organisms is called a chemofossil. 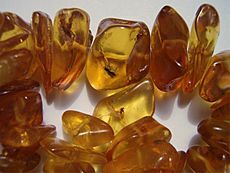 Objects made by prehistoric people are called artifacts. Silicified (replaced with silica) fossils from the Road Canyon Formation (Middle Permian of Texas). A coprolite of a carnivorous dinosaur found in southwestern Saskatchewan. Ichthyosaurus and Plesiosaurus from the 1834 Czech edition of Cuvier's Discours sur les revolutions de la surface du globe. Fossil Facts for Kids. Kiddle Encyclopedia.